The Falcon designed and manufactured in the USA by VersaLogic is an extremely small and rugged embedded computer. The Falcon has been engineered and tested to meet the military and medical industries’ evolving requirements to develop smaller, lighter and lower power embedded systems while adhering to stringent regulatory standards. 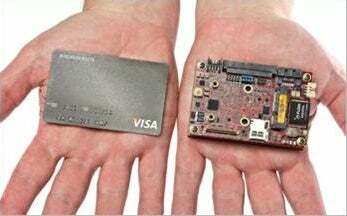 Roughly the size of a credit card and less than one inch thick, the Falcon is the embedded industry’s smallest, lightest, ultra-rugged embedded x86 computer. This embedded computer, equipped with an Intel Atom E6x0T processor, is designed to withstand extreme temperature, impact and vibration. The popular UEILogger has been upgraded to provide new performance levels. The overall sample rate has been increased by an order of magnitude and the maximum SD card size has gone from 4GB to 32GB. In addition, the UEILogger now provides alarm outputs and can log data from the MIL-STD-1553 bus. The CX-DP COM Express Development Platform from Extreme Engineering Solutions (X-ES) targets the X-ES Small Form Factor (SFF) XPand6000 Series and other COM Express applications to enable early development and rapid prototyping. It provides a convenient desktop setup with standard I/O connectors. The CX-DP includes all of the functionality of the XPand6000 series, including support for a COM Express module, a PMC or XMC, and an SSD. With the CX-DP, the transition from development to the target XPand6000 Series system or custom COM Express carrier card is made easy. The CX-DP provides basic COM Express I/O via fixed connectors, which are accessible through the back panel of its ATX chassis. Additionally, it provides a COM Express I/O Module (CIM) site for access to I/O not available at the fixed connectors. Simply removing the ATX case cover gives access to internal fixed I/O and PIM I/O. The Trenton Systems TSS5203 product is unique in that it hosts three Single Board Computers along with three BPX5 PCI Express backplanes and features up to 48 front-mounted, hot-swap drive carriers – providing 16 drives dedicated to each SBC – ideal for cross domain secure applications within the government and military space.